1. Let pie crusts stand at room temperature as label directs to soften slightly. Adjust 1 oven rack to lowest position and 1 oven rack to middle position in oven. Line heavy rimmed baking pan with foil; place on lowest rack while oven preheats. Preheat oven to 450°. 2.In large bowl, with mixer at medium speed, beat pumpkin, brown sugar, flour, pumpkin pie spice and salt 1 minute or until well blended. Add eggs, 1 at a time, scraping bowl occasionally with rubber spatula. Reduce speed to low; gradually add evaporated milk and molasses, and beat just until combined. 3.Unroll 1 pie crust and place in 9- to 10-inch glass or ceramic pie plate. Unroll second pie crust onto cutting board; invert 8-inch plate or cake pan onto center of crust. With small knife, cut around edge of plate. Place dough ring over edge of crust, then fold over and press onto outer rim of crust in pie plate to make a thicker rim. If desired, make desired decorative edge. Pour filling into pie crust. Place pie on prepared baking pan in oven. Bake on lowest oven rack 15 minutes. 4.Meanwhile, spray cookie sheet with nonstick cooking spray. With small cookie cutter or knife, cut out several leaf shapes. Transfer leaves to prepared cookie sheet. With knife, press lines on leaves to resemble veins. 5.Reduce temperature to 350°. Bake pie 22 to 25 minutes longer or until knife inserted 1 inch from edge of pie comes out clean and center is almost set. Meanwhile, bake leaves on middle oven rack 10 to 12 minutes or until lightly browned. Transfer leaves to wire rack to cool completely. Remove pie from oven; cool completely on wire rack. Refrigerate pie at least 2 hours before serving or up to overnight. Store leaves in tightly covered container until ready to use. 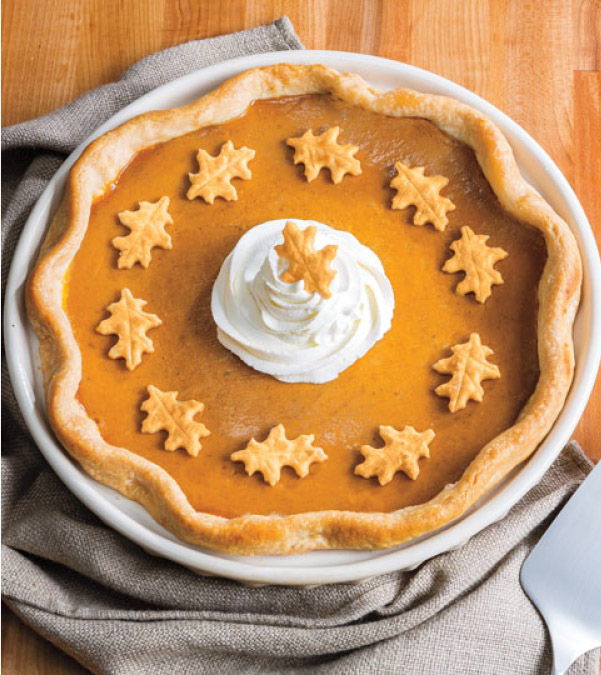 To serve pie, arrange leaves in circular pattern on top of pie. If desired, serve with whipped cream.